For the past several years, Splashpads have topped the request list of recreation amenities most desired by municipalities and their citizens. Splashpads often complement traditional dry playgrounds and existing pools, however, many times they are a stand-alone aquatics amenity and often replace traditional pools altogether. For many cities, Splashpads offer a simpler, more affordable aquatics recreation alternative. These zero-depth aquatics facilities are a cost effective method for municipal clients small and large, to offer summer time fun in the face of ever-shrinking budgets. Although Splashpads have been around since the mid-1980’s (and even before in various incarnations), there are a great many questions that clients have as to how to successfully execute a Splashpad project. So what is a municipal official to do? The answer is simple. Contact Power Play and Vortex Aquatic Structures and arm yourself with information. Power Play partners with Vortex Aquatic Structures International, the world leader in aquatic play products, to create unique and exciting Splashpad and Poolplay projects. We are the Vortex representative in Oklahoma, Arkansas, Kansas, and Missouri and have completed more than 150 aquatic play projects. Vortex has more than 6,000 installations at locations around the world in public, commercial and entertainment settings. Vortex operates a state of the art manufacturing facility and is continually developing new educational and interactive products which allow children to use their imaginations and work together to manipulate the water features. 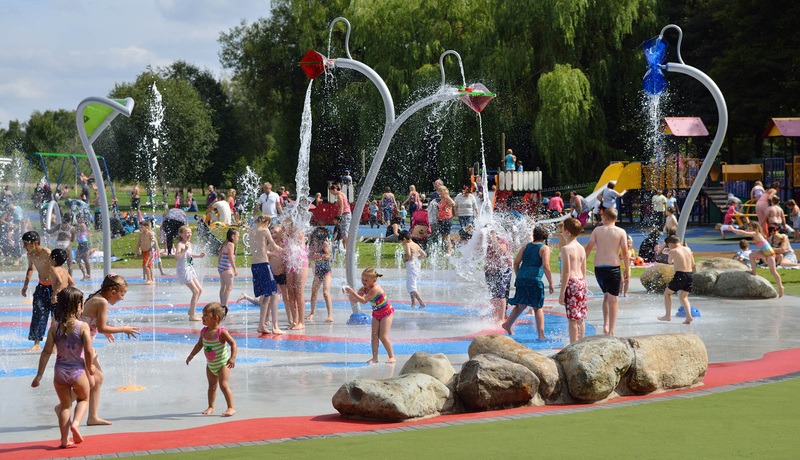 Splashpads, also known as spray parks, spray grounds or water playgrounds, have little or no standing water and therefore require no lifeguard on site. These water playgrounds consist of different water movements such as flowing, misting, and jetting and Vortex offers more than 250 diverse products for an unequalled aquatic play adventure. Splashpads offer something from toddlers to teens with non-intimidating ground sprays and toddler height water features for the little ones and higher volume sprays and dumping elements for older users. Vortex Poolplay and Elevations can enhance pools or lazy rivers by providing an engaging and fun environment for all ages. These are great for both residential neighborhood pools as well as aquatic centers, activity pools, large water parks and hotels or resorts. Elevations add dimension to pools by incorporating multi-level adventure with slides, platforms, dumping buckets, and play areas. Inspired by nature’s flowing streams, Water Journey is a collection of 4 events providing different play experiences. Whether it’s a single event or multiple connected together, Water Journey creates vibrant spaces inviting everyone to play, socialize or just contemplate. Maneuverable levers, water gates and pumps create an exciting chain reaction of water effects to capture the imagination, encourage teamwork and teach the relationship between cause and effect. The Vortex Watermark is a cutting edge interactive centerpiece that manipulates the flow of water to create patterns and words. This digital water expression uses LED lighting to provide color and assist with branding all while being controlled with your mobile device. This allows you to engage people instantly with custom words, shapes or patterns. A digital water expression is ideal for urban spaces, hotels, water parks, shopping centers, commercial spaces, airports, spas, exhibition centers, tradeshows, events, and advertising. Within any aquatic play area or Splashpad, shades and shelters are a necessity for outdoor activities. Our shades and shelters offer various materials such as steel, wood or fabric for the awning. These structures are great for hot summer days and for a snack break. As for site amenities, Power Play offers a variety of furnishings such as trash cans, tables, and benches that are offered in different styles, colors, and prices. These site amenities complete the park setting by adding places to sit while you’re watching your children play and places to eat lunch. We offer playgrounds from several different manufacturers to help you find the perfect type of equipment for your park. Whether it’s a traditional, themed or custom look you are going for, we can help you find design and select just the right equipment. Our playgrounds feature pieces such as straight slides, double slides, tube slides, tot swings, climbers, curly climbers, swings, and other elements for creative play. With all of the diverse products we offer and our experience in the industry, Power Play can help you make a statement within your city or neighborhood park, pool or aquatic center. Contact Power Play today!